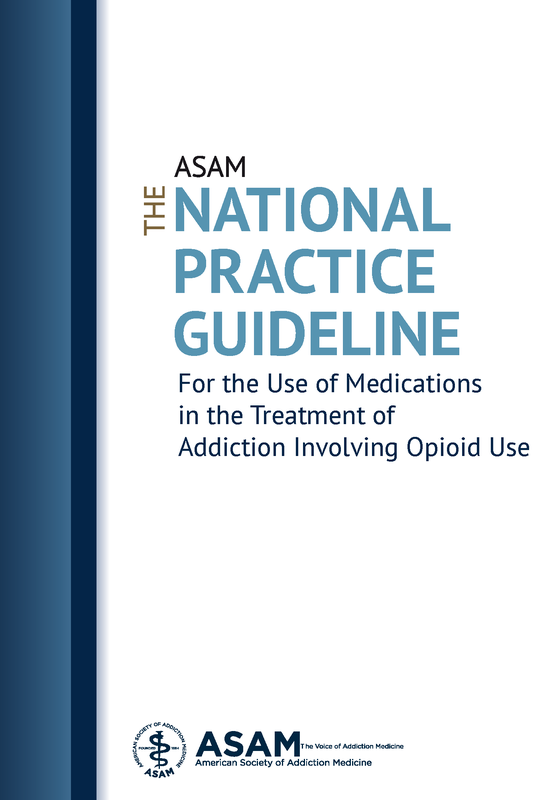 American Society of Addiction Medicine (ASAM) national practice guideline for the use of medications in the treatment of addiction involving opioid use. Journal of Addiction Medicine: 2015, 9(5), p. 358–367. Unable to obtain a copy by clicking title? Try asking the author for a reprint by adapting this prepared e-mail or by writing to Dr Jarvis at mjarvis@geisinger.edu. From the USA’s professional society for clinicians and allied professionals in the field of addiction medicine, comprehensive recommendations on how doctors can use medications to treat addiction to heroin and other opioids. Summary The US government’s Centers for Disease Control have recently described opioid use and resultant deaths as an epidemic. Treating this disease well with medications requires skills and time that are not generally available to primary care doctors in most practice models. Suboptimal treatment has probably contributed to expansion of the epidemic and concerns over unethical practices. At the same time, access to competent treatment is profoundly restricted because few physicians are willing and able to provide it. This US practice guideline from the American Society of Addiction Medicine (ASAM) was developed to assist in the evaluation and treatment of opioid use disorder, and in the hope that, using this tool, more physicians will be able to provide effective treatment. ASAM is a professional society representing over 3600 physicians, clinicians and associated professionals in the field of addiction medicine. The featured article summarises the guideline; the full guideline is also available. Although there are other guidelines for the treatment of opioid use disorder, none have included all of the medications used at present for its treatment. Moreover, few of the existing guidelines address the needs of special populations such as pregnant women, individuals with co-occurring psychiatric disorders, individuals with pain, adolescents, or individuals involved in the criminal justice system. The guideline was developed through a process that combines scientific evidence and clinical knowledge to determine the appropriateness of a set of clinical procedures. It encompassed review of existing guidelines, literature reviews, appropriateness ratings, necessity reviews, and document development. For this project, the American Society of Addiction Medicine selected an independent expert committee to oversee guideline development and to assist in writing. Recommendations included in the guideline encompass a broad range of topics, starting with the initial evaluation of the patient, the selection of medications, the use of all the approved medications for opioid use disorder, combining psychosocial treatment with medications, the treatment of special populations, and the use of naloxone for the treatment of opioid overdose. Medications covered for withdrawal and/or maintenance and relapse prevention include methadone, buprenorphine, naltrexone, and clonidine.